Brood parasites are animals, usually birds, which trick other species to raise their young. The best-known example is the cuckoo. The way it works is the parasite develops faster than the resident eggs, kills its nestmates and turfs them out of the nest. 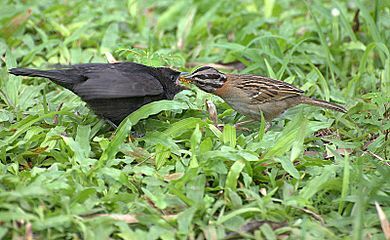 The adult birds cannot tell the difference in the young, and spend their time raising the offspring of another species. In some cases, the parasite has the ability to make the begging cheeps of the host species. Similar methods are used by some fish and insects. In many monogamous bird species, there are extra-pair matings resulting in males outside the pair bond siring offspring and used by males to escape from the parental investment in raising their offspring. This form of cuckoldry is taken a step further when females of the goldeneye (Bucephala clangula) often lay their eggs in the nests of other individuals. Intraspecific brood parasitism is seen in a number of duck species, where females often lay their eggs in the nests of others. Interspecific brood-parasites include the indigobirds, whydahs, and honeyguides in Africa, cowbirds, Old World cuckoos, black-headed ducks, and some New World cuckoos in the Americas. Seven independent origins of obligate interspecific brood parasitism in birds have been proposed. While there is still some controversy over when and how many origins of interspecific brood parasitism have occurred, recent phylogenetic analyses suggest two origins in Passeriformes (once in New World cowbirds: Icteridae, and once in African Finches: Viduidae); three origins in Old World and New World cuckoos (once in Cuculinae, Phaenicophaeinae, and in Neomorphinae-Crotophaginae); a single origin in Old World honeyguides (Indicatoridae); and in a single species of waterfowl, the black-headed duck (Heteronetta atricapilla). Most avian brood parasites are specialists which parasitize only a single host species or a small group of closely related host species, but four out of the five parasitic cowbirds (all except the screaming cowbird) are generalists which parasitize a wide variety of hosts; the brown-headed cowbird has 221 known hosts. 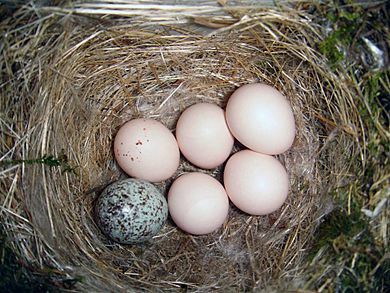 They usually lay only one egg per nest, although in some cases, particularly the cowbirds, several females may use the same host nest. 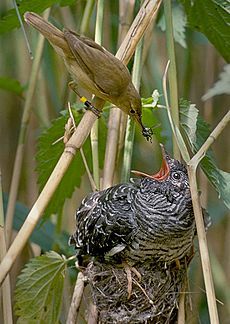 The common cuckoo presents an interesting case in which the species as a whole parasitizes a wide variety of hosts, including the reed warbler and dunnock, but individual females specialize in a single species. Genes regulating egg coloration appear to be passed down exclusively along the maternal line, allowing females to lay mimetic eggs in the nest of the species they specialize in. Females generally parasitize nests of the species which raised them. Male common cuckoos fertilize females of all lines, which maintains sufficient gene flow among the different maternal lines to prevent speciation. A mochokid catfish of Lake Tanganyika, Synodontis multipunctatus, is a brood parasite of several mouthbrooding cichlid fish. 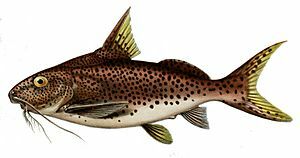 The catfish eggs are incubated in the host's mouth, and—in the manner of cuckoos—hatch before the host's own eggs. The young catfish eat the host fry inside the host's mouth, effectively taking up virtually the whole of the host's parental investment. A cyprinid minnow, Pungtungia herzi is a brood parasite of the percichthyid freshwater perch Siniperca kawamebari, which live in the south of the Japanese islands of Honshu, Kyushu and Shikoku, and in South Korea. Host males guard territories against intruders during the breeding season, creating a patch of reeds as a spawning site or "nest". Females (one or more per site) visit the site to lay eggs, which the male then defends. The parasite's eggs are smaller and stickier than the host's. 65.5% of host sites were parasitised in a study area. 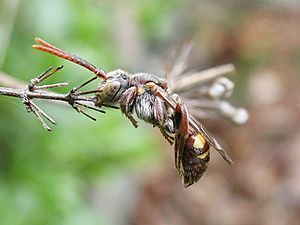 There are many different types of cuckoo bees, all of which lay their eggs in the nest cells of other bees, but they are normally referred to as kleptoparasites (Greek: klepto-, to steal), rather than as brood parasites, because the immature stages are almost never fed directly by the adult hosts. Instead, they simply take food gathered by their hosts. Examples of cuckoo bees are Coelioxys rufitarsis, Melecta separata, Bombus bohemicus, Nomada and Epeoloides. Kleptoparasitism in insects is not restricted to bees; several lineages of wasp including most of the Chrysididae, the cuckoo wasps, are kleptoparasites. The cuckoo wasps lay their eggs in the nests of other wasps, such as those of the potters and mud daubers. Brood parasitism Facts for Kids. Kiddle Encyclopedia.